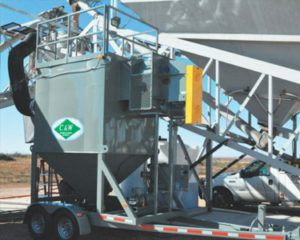 C&W’s Mobile Dust Collectors offer Cartridge Pulse technology combined with a truly mobile dust collection system for producers on the move. These Mobile systems feature a Quick Voltage Connect System for easy transportation of the unit so you don’t lose any production time. These are efficient and user-friendly units with no permit required when traveling on the highway and do not required a crane for erection. Our CP-Series Mobile Dust Collector provides the best filtration available and tool-less media exchange. View a full line of Mobile Dust Collectors, and Dust Collection Systems. We offer worldwide shipping on all Central Dust Collector Parts & Components.